THE HASHTAG FOR GRAND PRIX PRAGUE IS #GPPRAGUE. JOIN THE CONVERSATION. With an original field of 1,999 cut down to 377, the second day began with Modern showing itself from its best, its weirder side. One match involved the casting of Zacama, Primal Calamity, another involved tapping Astral Cornucopia for an arbitrarily large amount of mana to create sheer infinite Snakes with Orochi Hatchery! Later on, the hijinks subsided a little, but still there were news to report from the metagame side of things. For one thing, this was kind of the breakout event for Spirits. With the help of recent addition Supreme Phantom, two Spirit decks made it to the playoffs and another two placed within the Top 32, rivaling Humans for the most successful tribal deck in modern Modern. Meanwhile, White-Blue Control took the largest share of the Day 2 metagame, but remained largely absent from the Top 8. It still was by far the biggest player in the Top 32 though. In the end, the biggest player in the Top 8 proved to be Lauri Pispa, who took his Hardened Scales past all opposition. In the semifinals, Pispa won a nailbiter against Ondřej Stráský who got Pispa down to 1 life before the latter shot 19 points worth of Walking Ballista at Stráský. In two games of the finals, Theau Mery and his Humans stood no chance against the incoming robots either. Congratulations to Lauri Pispa, champion of Grand Prix Prague 2018! 1,999 players came to Prague this weekend to test their mettle in Modern. They bridged vines, worked irons, snapcast mages, completed Trons, melted pinnacles, hardened scales, and engaged in human interaction. 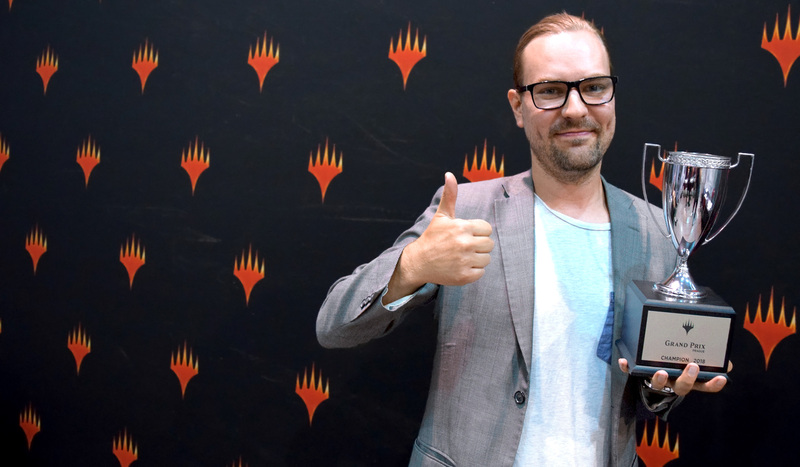 At the end of the day, 377 of them earned an invite back for more Modern on Day 2, and a whopping thirteen players stood above the rest with a perfect record of 8-0: (9) Javier Dominguez, Bastian Lange, Troels Munk, Ondřej Stráský, Louis Deltour, Alex Roebuck, Silvan Kruijer, Riccardo Picciafuochi, Florian Kirchbacher, Lauri Pispa, (10) Grzegorz Kowalski, Michal Szulborski, and Andreas Ehrhardt. Join us and them and 364 others on Sunday for more Modern action and for the epic conclusion of Grand Prix Prague 2018!